I once heard that social media is like the fun, unpredictable uncle of the marketing family. While some of that may be true as marketing trends seem to adjust and change daily, there are ways to expect the unexpected and see trends that can help you determine strategies to execute for the best results. How do these efforts affect my bottom line? What’s the benefit of paying someone to do it for me? How do you guys do it all so effortlessly? We get these questions a lot – and we’re here to give you some answers. Let’s get started. Social media ROI is essentially what your business gets back from the time, money and resources you place towards social media marketing. Now, you can track it based on ‘vanity’ measures which are simple page likes, comments, shares or followers. While that’s important to your overall brand awareness, it doesn’t necessary correlate to bottom line conversions or website traffic. According to a recent survey by Convince & Convert, nearly 41% of companies stated they didn't know whether their social media efforts were paying off. Yikes! Surely you wouldn’t conduct other transactions in your business without calculating and determining the return on investment, right? That’s just madness! Social media – and digital marketing as a whole – should be treated the exact same way. Keep in mind, however, that revenue generator or not, social media of any kind is essential to providing your business with relevance to the consumer-demanding world. Out of the aforementioned 41% of companies that say they aren’t aware whether or not their social media is paying off, 39% say it was due to lack of analytics expertise or exposure to resources. We get it, we really do. It can be a daunting challenge but an extremely necessary one and it’s easily conquerable. Here at Visionary, we have built-in metric capabilities to assist in achieving a wide range of business objectives. For example, one of Visionary’s social media goals is to increase brand and service awareness. We do this by exposing our unique office culture, our support for the community, partnerships with current clients and highlighting our 25th anniversary milestone. We gauge this success based on reports generated from Sprout Social that not only determine what vanity benchmarks we hit but we can also determine our social media strength against similar companies. Our reports list everything from engagement percentages to overall reach which can be organic or paid. From this, we set weekly and monthly goals while tracking our overall momentum that can be converted into website clicks, social mentions and building potential brand influencers. 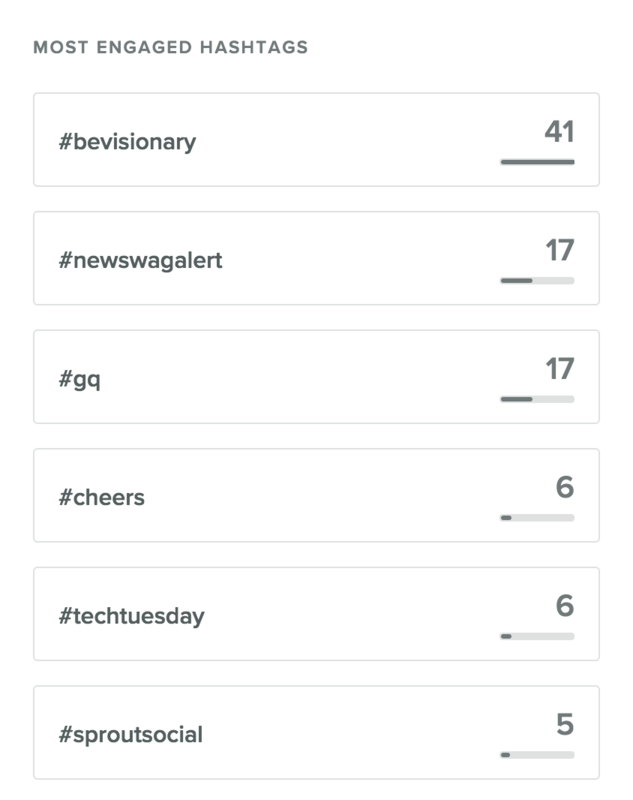 You can even break down who is visiting your social platforms by countries, local cities, gender and age as well as determine your most engaged hashtags you have used for posts. Pretty neat, huh? We create daily, weekly, monthly and quarterly reports that help differentiate what works from what simply doesn’t. Each day we look at the trends to analyze our best approaches. We aren’t easily satisfied, so we constantly try to push the bar higher, and our goal is to help you achieve yours. This ROI process is not only possible, it’s vital. Besides what we’ve already stated, you need to be measuring the data coming from your preset social media analytic tools so you can best gauge the trends going on, determine your place against competitors, your overall brand awareness and your ability to effectively communicate with your like-minded target market. Just like any type of measurement, it’s vital to see where a business can make improvements, and to do that, you have to put in the time and effort to understand the numbers. You simply can’t measure what you aren’t tracking. The benefit of allowing Visionary an inside look into your business goals for digital marketing means we can bring our arsenal of tools and connections to help set you up for success. We can help explain the metrics, assist in emphasizing the goals you want to achieve and devise the best plan to go about obtaining them. Identify your key performance indicators (KPIs): What’s your overarching goal? Are you wanting to determine revenue generation or brand recognition and awareness? Be sure that all stakeholders agree with these goals in detail. Align your social media goals with your business objectives: If you’re looking at increasing revenue, you might want to push promotions, product information or signups on your social platforms. If you’re wanting to do more brand awareness, you should do some social listening and find unique ways to expose what your business offers to gain new potential consumers and brand advocates. Set up Google Analytics to track conversions: We’re big Google Analytics people here! Nearly each goal is measurable if you know how to adapt the tool effectively to your needs. Assign values to your KPIs: Determine the monetary value of your goals through avenues like lifetime value, average sales purchased through your website or a PPC valuation which highlights how much you’d end up paying if you used more traditional advertising versus social media. Benchmark against your competitors: There is nothing wrong with comparing yourself to a like-company that may or may not be a direct competitor. Take a look at the company size, the demographic area they serve and their support/product offerings when choosing a few to align your social media platforms to. This will allow you to see what they’re prosperous at so you can adapt it to your own target market through posts and page engagement. In summation, social media ROI is completely possible with the right tools in place and understanding in how to best utilize, manipulate and analyze the data results. Good thing we know how to do just that, am I right? Often times, it takes a village, so just like one of the greatest songs in the history of music, The Beatles’ With a Little Help From my Friends, we’re here to get you by. Reach out to us and let’s get you set up to see social media propel your business forward in this ever-changing ‘unpredictable uncle’ marketing world.